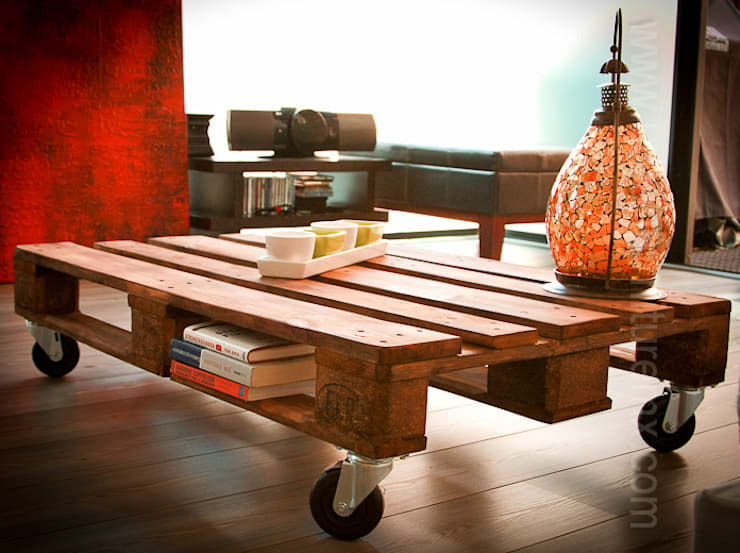 Pallet furniture is an industrial chic DIY project that anyone can do over a weekend. Using the pallets as a starting point, you can create innumerable projects for the home. You can stack, stain, paint, and finish them any way you want. It’s a cheap alternative to buying new furniture with an added bonus of giving your home more character. Wooden pallets are used around the world to ship and store the products we use every day. They’re found everywhere from supermarkets to construction sites. Ready get inspired by the chic pallet furniture designs that we love? Read on and start our guide to DIY furniture bliss. One of the most popular and handy pallet projects is to stack them underneath a mattress to make a bed! This is perfect for a guest room or for when you need a quick solution for a mattress on the floor! 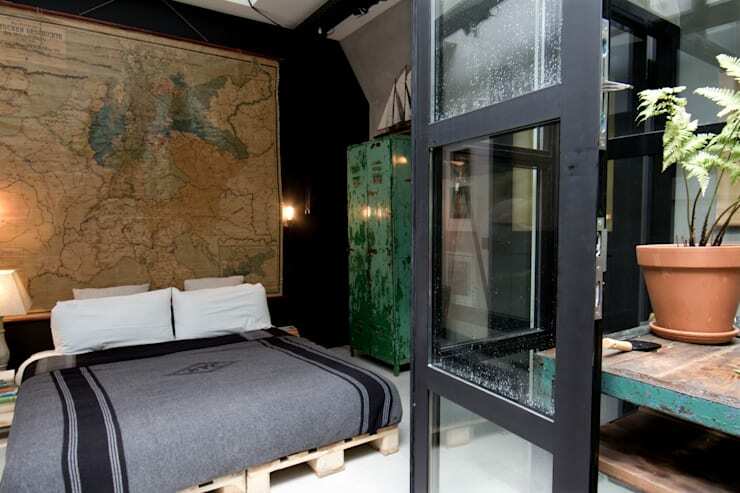 In this room, the pallet bed keeps its natural colour and finish. It fits with the effortless industrial vibe of the home. A pallet bed like this is made by placing pallets side by side, stacking to the desired height. Then use connecting plates to stick them together. Almost like lego for furniture and just as fun. Check out the living room in this home! The sofas and the coffee table are sporting matching pallet bottoms. This room has a mature elegance to it that we did not expect to find! Pallet projects can suit any style. The furniture is low to the ground, exuding a casual elegance. For a look like this, combine high-quality materials and fabrics with the low-cost pallet wood. Here's a simple DIY project that will give you that industrial vibe instantly. Check out this coffee table on castors. It illustrates the effortless minimalism of pallet furniture. The pallet is transformed into a coffee table with hidden storage thanks to casters and a new stain. Don’t want the fuss of a coffee table? This is the perfect solution because you can roll it away when you don't need it. 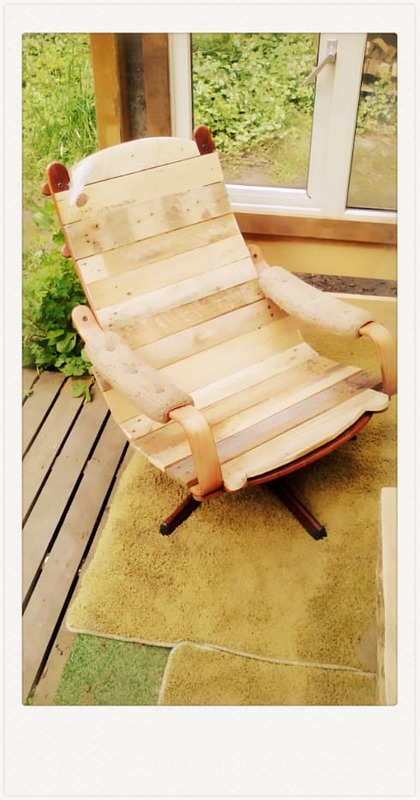 This chair is built from deconstructed pallets and scrap wood. 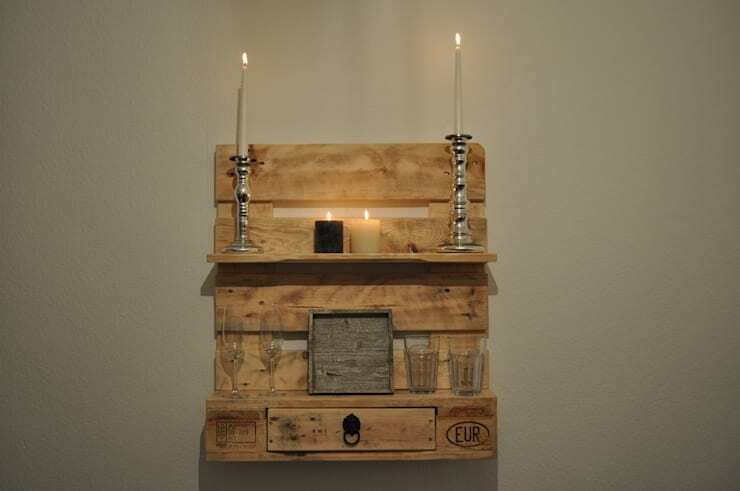 DIY projects like this take advantage of the raw materials of pallets without conforming to the shape. This is a more challenging project perfect for those who love to solve puzzles and get their hands dirty. The result is a one of a kind piece in your home that you can be proud of! Here’s a sneaky pallet project we hardly recognized as DIY! 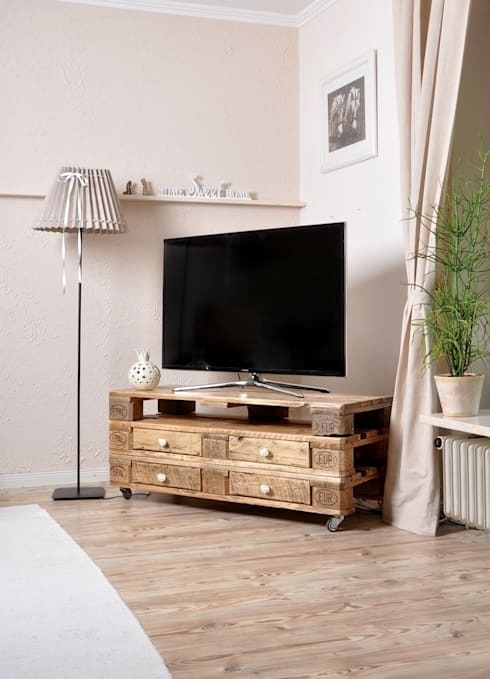 This country style living room features a TV stand refurbished from pallets. Check out the drawers they built inside. The sky's the limit when you DIY with pallets! If you have questions or want some help, connect with professionals on homify today to help you finish your dream project. Outdoor furniture is perfect for pallet projects! Perfect for using pallets that are treated for the outdoors. This patio furniture set features a double height pallet coffee table and a bench. The cushioning can be tucked away when it rains. 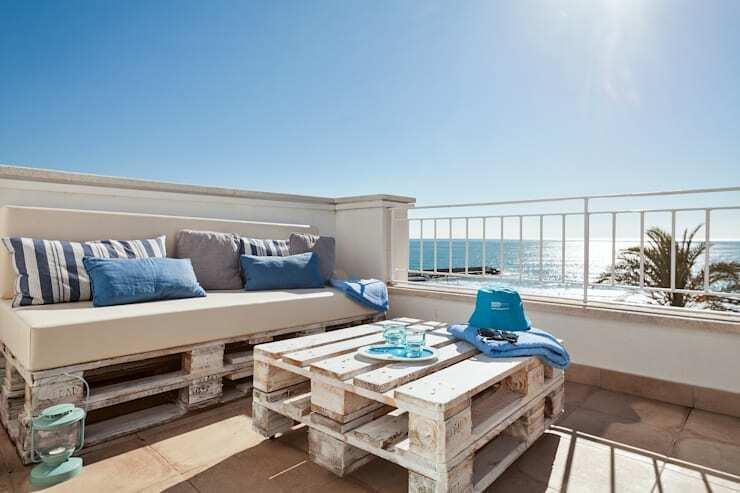 This deck space transports you to the tropics with its blue accents and casual style! Experiencing budget cuts at work? Why not redecorate the office with pallets like in this example. You can link them together to create desks and top them with a glass plate. The look is simple and clean. Since you can see through pallets, they create a greater sense of space wherever they are. Thank you for reading our guide to pallet furniture! There are some incredible ideas here, but we’re sure that your own project will be even more inspiring. For more DIY home inspiration, check out our feature on 15 home DIY projects you can try today! What pallet project are you wanting to try?